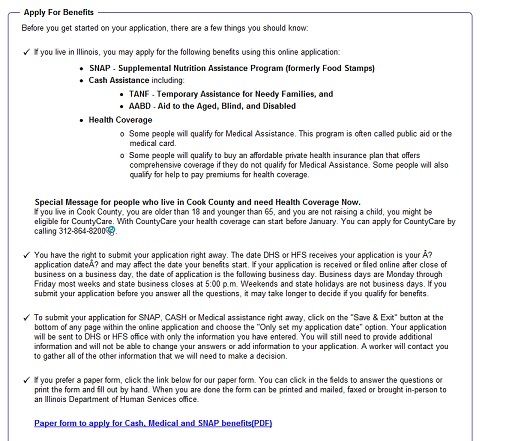 An introduction to the new web portal for Medicaid, SNAP and cash assistance. 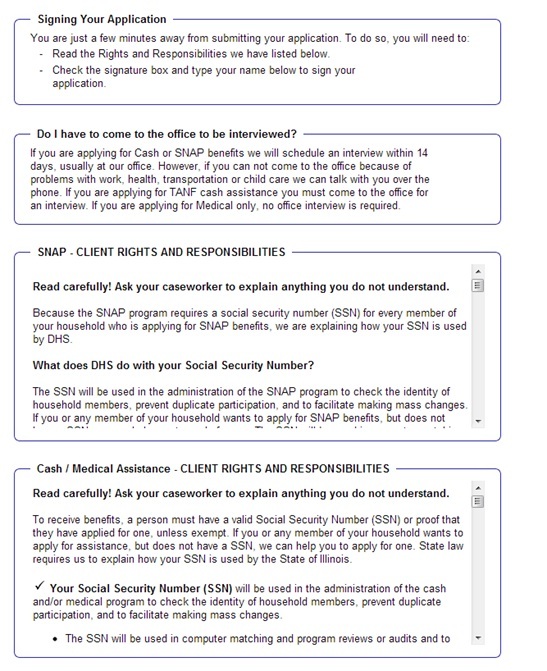 State of Illinois has a new web-based application portal for Medicaid, SNAP and case benefits. We call it ABE, the Application for Benefits Eligibility. This overview will familiarize you with some of ABE's features and explain how to set up your user account and submit an application. Throughout this document "Medicaid" refers to all health coverage programs provided by HFS, including All Kids; FamilyCare; AABD; the new ACA Adult group, coverage for undocumented pregnant women and children; and other health coverage financed by HFS using only State funds. Beginning October 1, 2013, there are two new Medicaid eligibility groups - ACA Adults and Former Foster Children. These individuals may apply for Medicaid coverage through ABE. As of October 1, 2013, new federal Medicaid eligibility rules apply, including the new Modified Adjusted Gross Income (MAGI) standard. The ABE Application includes new questions on household composition, tax filing status and income. 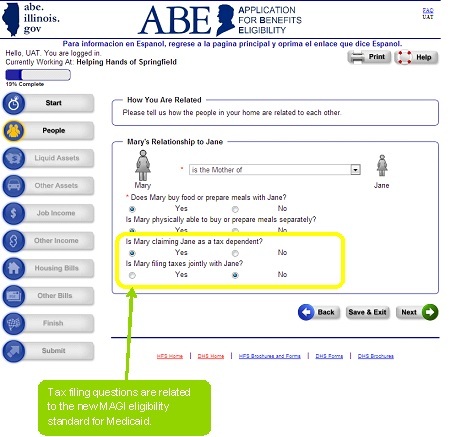 If you have used either the All Kids/FamilyCare Online Application or the DHS Web Benefits Application, ABE application questions will be familiar, although some terms may have changed. 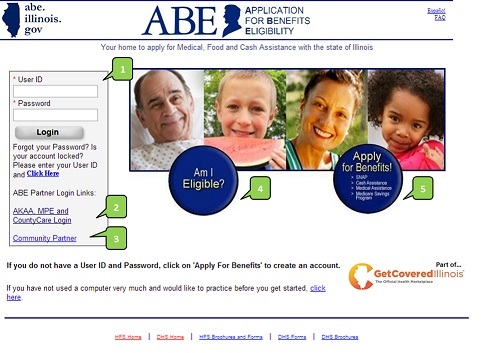 ABE stands for Application for Benefits Eligibility, Illinois' new combined online application. 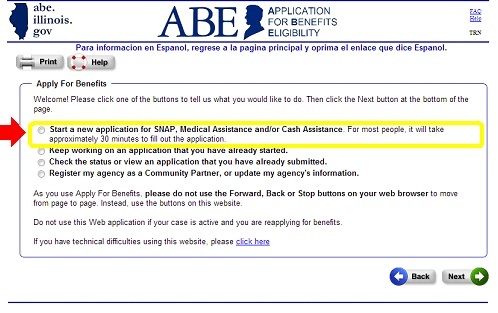 Anyone can apply for Medicaid, SNAP, cash benefits and the Medicare Savings Program through ABE. ABE also offers an "Am I Eligible?" 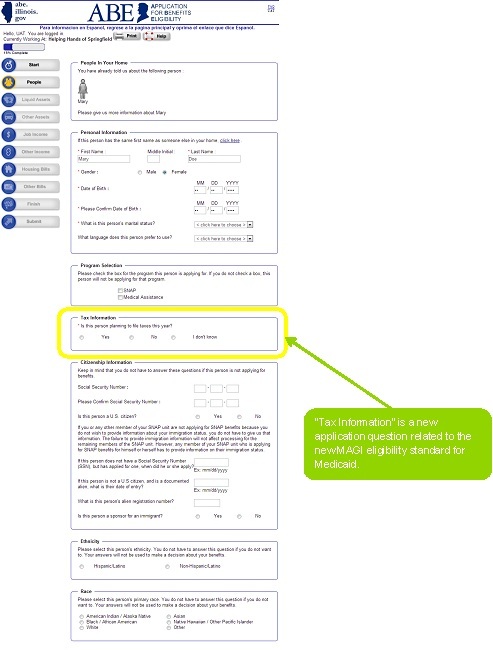 screening tool to determine if a person is likely eligible for benefits before completing a full application. The screening tool, however, is not a substitute for a full application. 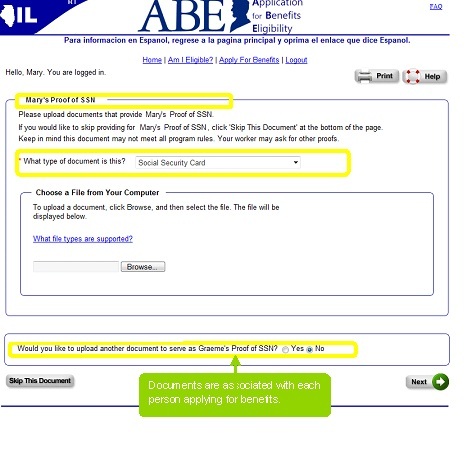 Applicants are also able to use ABE to upload verification documents to support their application. Applicants can save an application in process and return to it later to complete and submit it. Unfortunately, once an application is submitted changes cannot be made through ABE. Instead, applicants should communicate changes to the office that is processing the application. This information can be found on the summary page of the ABE application. 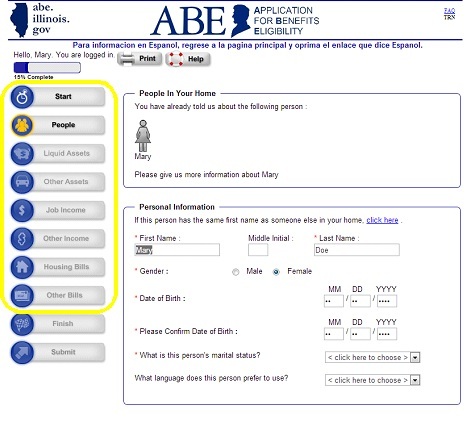 Community partners, including Illinois Navigators, can help someone complete an application in ABE. All Kids Application Agents (AKAAs) may submit benefits applications on behalf of Applicants for all programs - Medical, SNAP and cash. More information on registering as an AKAA is provided separately. MPE Providers who are enrolled with the Department of Healthcare and Family Services (HFS) to presumptively enroll pregnant women in Medicaid may also use ABE. In the future, customers will be able to check their benefit status, make updates to their accounts and renew their benefits through ABE. ABE can be used by anyone seeking Illinois Medicaid coverage, including new groups covered as a result of national health care reform under the Affordable Care Act. Beginning January 1, 2014, Illinois covers two new eligibility groups under Medicaid. income at or below 138% FPL (a 5% income disregard is built in). no income or resource test for this group. Modified Adjusted Gross Income (MAGI) is the new national methodology for determining eligibility for Medicaid for children, parents or other caretaker relatives, pregnant women and ACA Adults. MAGI directs how states count income and household composition for these groups. It is similar to the way income is counted for federal income tax purposes. MAGI rules will not be used for AABD eligibility for seniors, blind persons or persons with disabilities. Medicaid, including All Kids and FamilyCare, meets the ACA requirement for health coverage. There is no need for existing customers to reapply. There are no new or additional Medicaid benefits available to current recipients as a result of the ACA. Is ABE the Right Place to Begin? 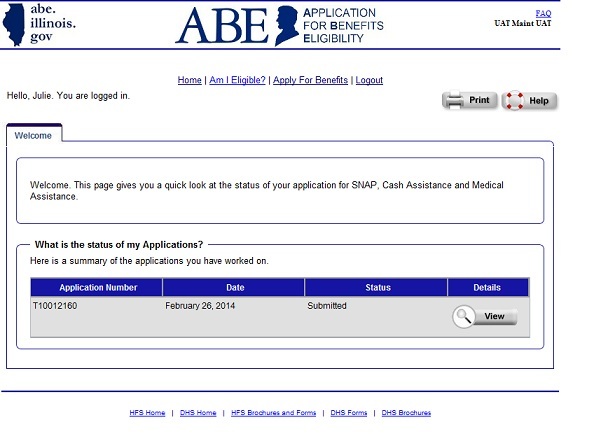 ABE is always the right place to start to apply for SNAP or cash assistance. For Medicaid, if you are not sure if you are eligible, go to www.GetCoveredIllinois.gov and click on "Explore your health coverage options." Here you will be asked questions about your household and referred either to ABE to apply for Medicaid, or to www.Healthcare.gov to apply for private insurance through the Federal Health Insurance Marketplace. Financial help may be available through the Marketplace to help lower the cost of private insurance. You can learn more about the Illinois Marketplace and available financial assistance at www.Healthcare.gov or by calling 1-800-318-2596. There is no wrong door - an application received by the Marketplace that looks to be eligible for Medicaid will be sent to the State - and vice versa - applications found to be ineligible for Medicaid will be sent to the Marketplace. We strongly encourage everyone - community partners, health care providers and the general public to apply for Medicaid, SNAP, cash assistance and the Medicare Savings Program online through ABE for the fastest service. ABE has a number of features to ensure that application data is transferred accurately and efficiently to caseworkers for processing. 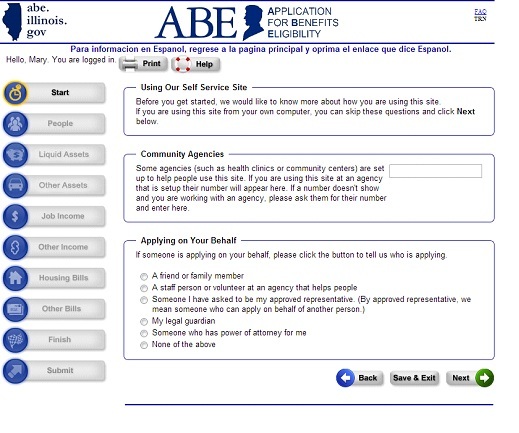 Applicants should include as much information as possible in their ABE application. Expect to spend 30 to 45 minutes completing an application for benefits. ABE does not replace the need for caseworker interviews for SNAP and cash benefits; Applicants will be contacted within 14 days for this interview. In most cases, interviews can be completed over the phone. Please review the following tips on navigating through ABE. Do not use the Internet browser's back, forward or stop buttons while in the application. 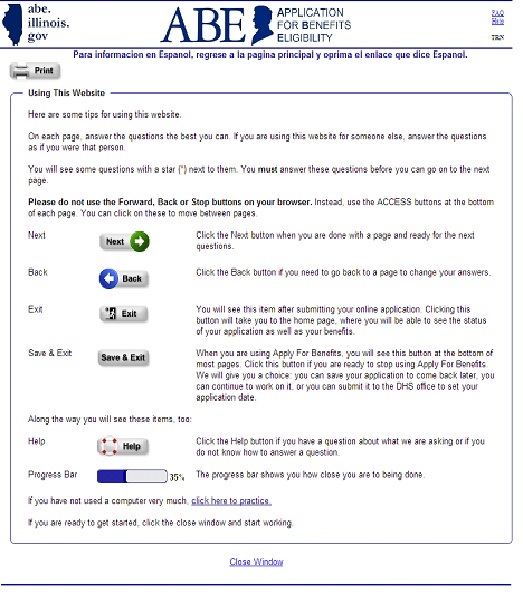 Use the buttons provided at the bottom of each page of the application. Use the "Save & Exit" button to save the information already entered and return to the application later. Your ABE session will time-out after 30 minutes of inactivity. You will need to log-in again to continue. To protect your personal data, be sure to logout of ABE after submitting your application or if you step away from your computer. User ID and Login - Applicants who have already started or submitted an application can enter their User ID and password here to continue working or check their status. First-time users click the blue, "Apply for Benefits" button (#5) to create a User ID and password. MPE Providers, All Kids Application Agents and CountyCare Assisters have a separate log-in process (#2). They can also use this link to update registration information. More information about this process will be provided to these entities separately. To register as a Community Partner or update community partner registration information, click on this "Community Partner" link (#3) or the blue, "Apply for Benefits" button (#5). 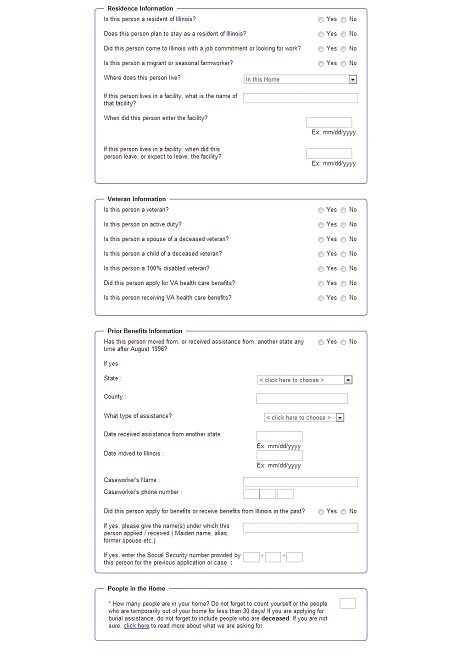 To reach an anonymous screening questionnaire to help determine if a person is potentially eligible for benefits, click the blue "Am I Eligible" button (#4). 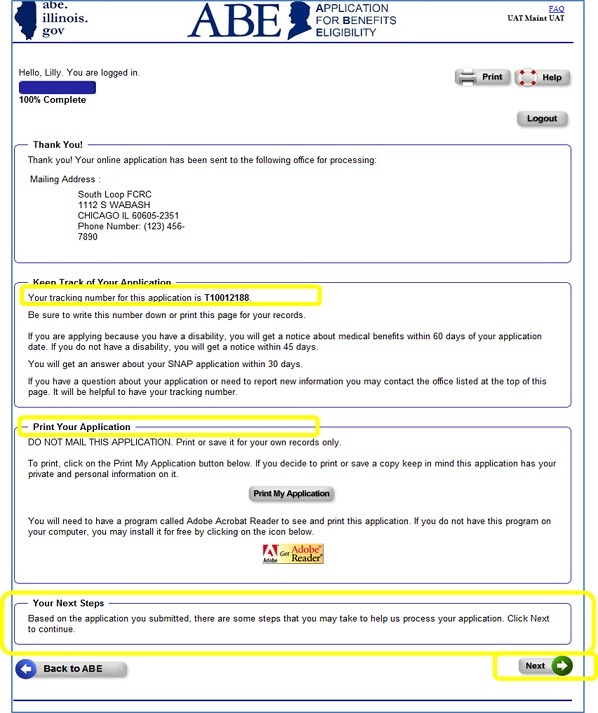 To start a benefits application, click on the blue "Apply for Benefits" button (#5). After an Applicant clicks "Apply for Benefits" they will be brought to this screen. To start a new application or to go on to create a User ID or password, click "Start a New Application" option. 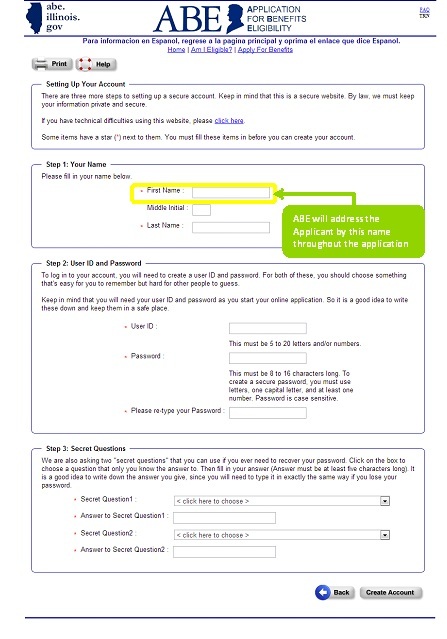 The first time Applicants enter ABE, they will need to create an account so they can come back to ABE later to check their application status or save their information and return to the application later. The Applicant, not someone assisting with the application, should read and indicate understanding and acceptance of the Fraud Penalty Affidavit. Indicate if someone is assisting with the application. If not, simply click "Next". ABE provides a detailed overview of available benefits. ABE will "customize" the application to gather only the information needed for the requested benefits. Applicants will be asked identifying information. The red asterisks (*) indicate required information. ABE will ask for several categories of information as indicated on the left-hand navigation bar. Applicants can save their data at any point and return to finish the application later. At the end of each data collection "module," the Applicant will review a summary of the information entered and have the opportunity to go back and make changes. The following pages are just a sample of the types of questions included in ABE. Applicants will be asked to review the Rights & Responsibilities for each benefit program applied for and electronically sign the application. After clicking "Submit," the Applicant will be given a tracking number and the option of printing a copy of the application. The Applicant can log out or upload verification documents by clicking "Next" from this page. If an Applicant needs time to gather proof documents, he or she can log back into ABE to upload documents up until a caseworker begins processing the application. See page 32 of this Guide for instructions. Be sure to logout of ABE if your session is complete! 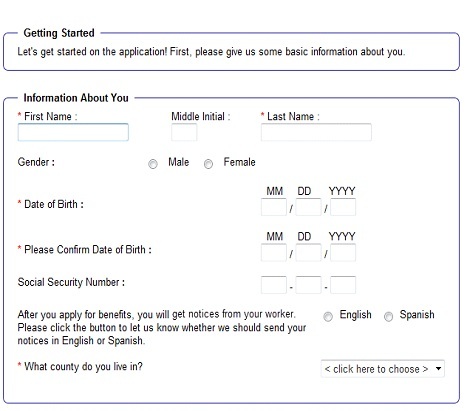 In cases where Applicants have social security numbers (SSN) for each person on the application [Note: SSNs cannot be required from those not applying for benefits, but are helpful], it is possible that additional proof may not be required since information can be verified electronically. The exception is if an Applicant's circumstances have changed recently and the electronic verification sources don't yet reflect those changes. 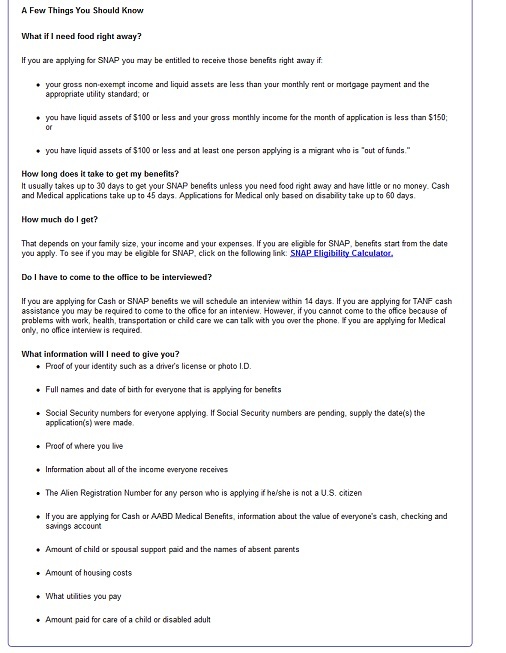 If someone does not have a SSN, that is alright, the application can still be processed. 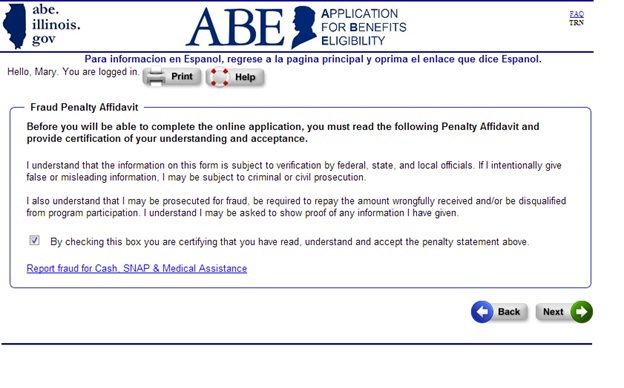 One of the great new features of ABE is the ability to securely submit verification documents with an application. 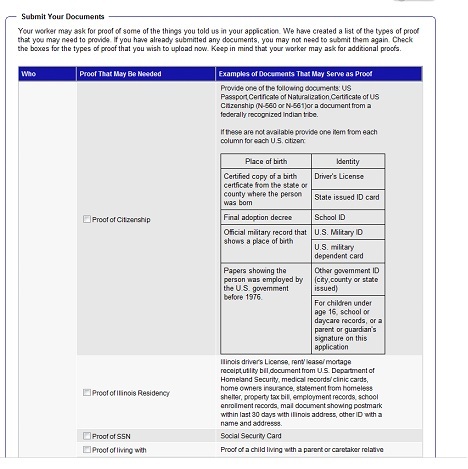 Below are types of proof that may be necessary and the types of documents that may serve as proof to ensure the application is successfully processed. 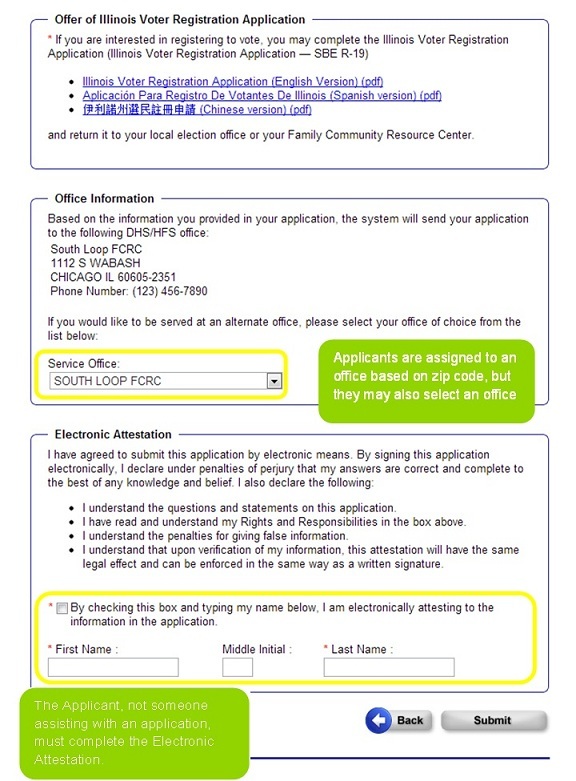 An Applicant does not need to collect all of these documents to submit an ABE application. 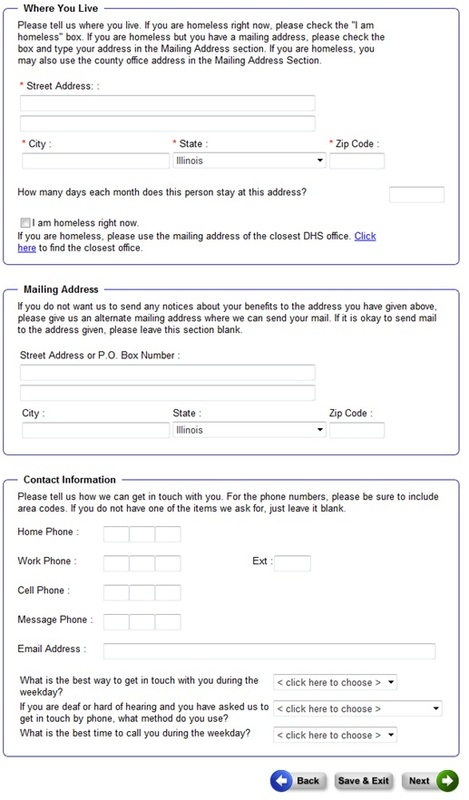 If the caseworker needs additional information, the Applicant will receive a written request in the mail. ABE will provide an upload screen for each document category selected on the previous page. 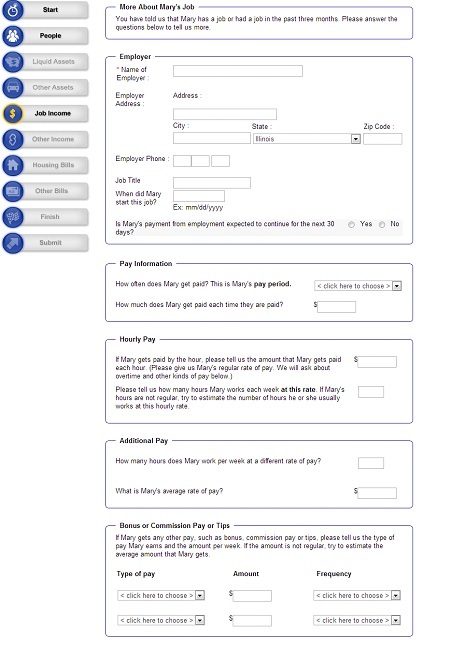 Documents are associated with each person applying for benefits on the Application. You may return to ABE to upload verification documents anytime up until a caseworker begins processing the Application. When you log back into ABE you will see a summary of the Application you recently submitted, click [View]. Click "View and Submit Types of Proof" [Next Steps]. From here, just follow the instructions on the screen. If the "View and Submit Types of Proof" [Next Steps] button is not visible, a caseworker has already begun processing the application, and the applicant will receive instructions in the mail about proof documentation that may still be required to complete the Application. 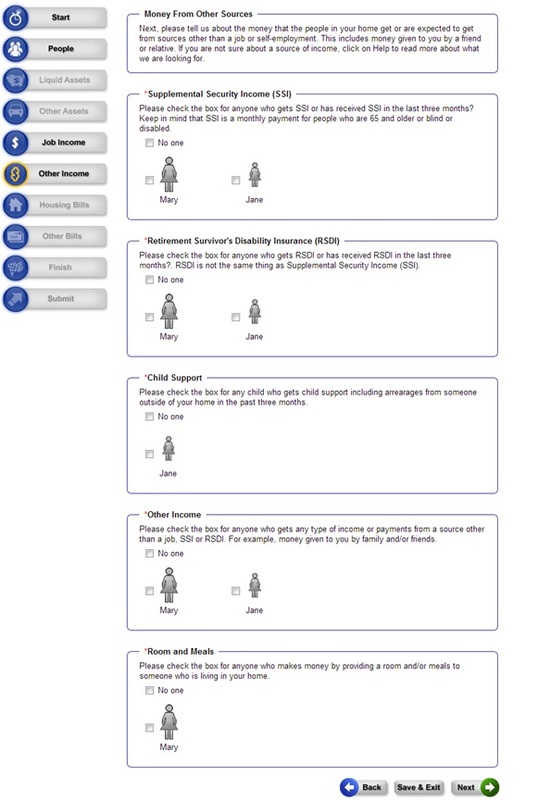 The Integrated Eligibility System (IES) is the new caseworker portal for eligibility determination and case management. 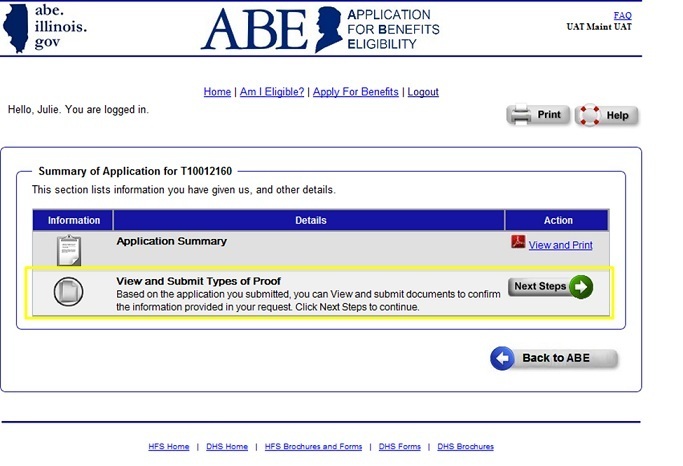 Once you submit an application in ABE, you can no longer make changes to it in ABE, but you are able to view the application as it was submitted. Applicants should contact the office where the application was sent for processing to report any changes. This information is printed on the ABE Application Summary page. 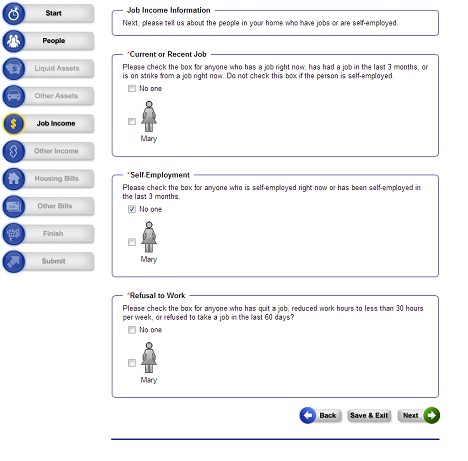 The new application will appear in an electronic inbox where a caseworker will take it from the queue and register it. The caseworker will schedule an interview with the customer, if necessary, and complete the data collection process. Interviews are required for SNAP and Cash Assistance. IES includes new electronic tools that interface with State and Federal data sources to verify information provided in the ABE Application. Applicants will be asked to provide required documentation for any information that cannot be verified electronically or to show proof of any information on the application that conflicts with electronic data such as a change in income due to a job loss or job change. The caseworker will then complete the determination of eligibility and the Applicant will receive a written notice of the decision in the mail. 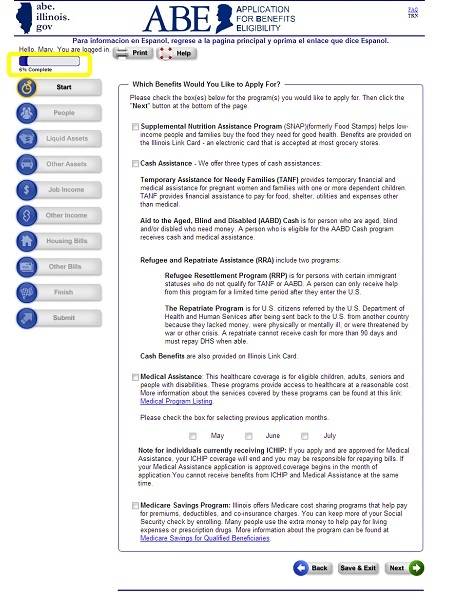 Applications for most Applicants who request but do not qualify for Medicaid will be automatically transferred to the Illinois Health Insurance Marketplace and will be used to determine what financial help would be available to reduce the monthly costs of buying health insurance through the Marketplace. Thank you for taking the time to review this overview and learn more about ABE - the Application for Benefits Eligibility. We hope you will find it a useful tool. 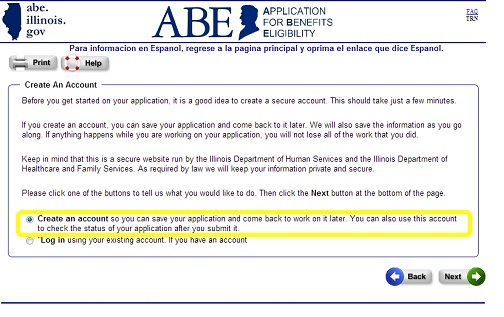 If you have any questions about using ABE, please e-mail them to ABE.questions@illinois.gov. 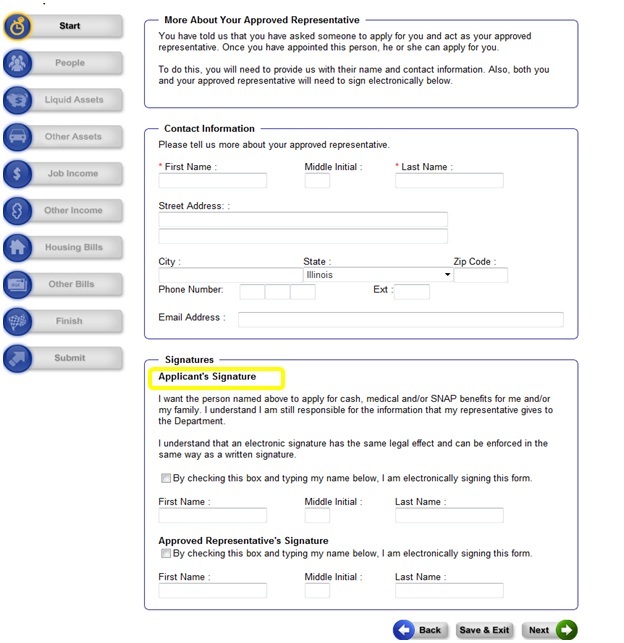 If the Applicant indicates on the application that an Approved Representative is applying on his or her behalf, the Applicant will be directed to this approval page to supply more information about their Approved Representative and will then provide an electronic signature. Note: Approved Representatives receive copies of all correspondence related to the person's application and case and must continue to represent the individual until that status is revoked. Approved Representatives are also bound by federal and state law regarding conflict of interest and privacy and confidentiality of applicant information.